If it can be tracked and quantified, it can be measured. This applies to eye movement, skin temperature, brain waves. As you scroll through a website—say, TheAtlantic.com—you’re sending a lot of signals. Your eyes dart from headline to headline, bypassing a few before choosing which to read. Your brow furrows at one article. You laugh at a clever turn of phrase in another. Your face flushes in anger when you watch a charged video on an issue important to you. Usually, all these physical cues go nowhere other than the reflection of your computer screen. But now, businesses are hoping to game your attention by closely examining all these bodily responses. The consulting firms that specialize in this research usually start by hooking focus-group participants up to research-grade neuroscience equipment as they browse a website or use an app. The devices offer highly specific biofeedback: Sensors analyze users’ gaze, their facial expressions, their skin cells, and even their brain waves. Consultants then produce reports with tailored recommendations on how their client might redesign the user experience to turn their ad, app, or website into the perfect attention trap. Companies already have enormous insight into what users do online. Web-analytics tools detail what pages users click on and which sites refer them. Companies such as Facebook track users all over the web, whether they’re logged in or not. But the core conceit of neuromarketing is that biometric data is more honest and robust than traditional survey data or even the wealth of traffic-analytics options that are already out there. Survey respondents may lie, the argument goes, but biometrics don’t. Say a bank has noticed a sharp drop in loan applications. It may ask Neural Sense to conduct a biometric survey in which respondents are outfitted with a host of sensors, then told to apply for a loan. In the next room, a team watches the respondents’ screen as they scroll through the pages, examining their biofeedback. Sensors attached to the wrists and fingertips measures the formation of sweat on subjects’ skin, a measure called galvanic skin response (GSR). Cameras trained on their face measure muscle movements, quantifying whether people are happy, sad, or frustrated at any moment. Iris trackers follow each respondent’s gaze, charting the areas of the screen the person spends the most time looking at. 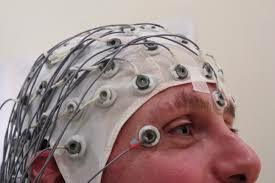 Finally, a brain-reading cap produces an electroencephalogram (EEG) that records the brain’s electrical activity and reveals the intensity of users’ emotions. In a typical survey, a respondent is given eight tasks over about 30 minutes. “As you layer more of the technologies and the more sophisticated they get, the costs increase,” Drummond explained. Most companies opt just for eye-tracking, the least expensive option, often coupled with facial-expression analysis. GSR is useful for longer tasks, he said, while EEG, the most expensive measure, gives the most insight into why people react the way they do. As with any focus group, diversity is key to having a representative sample, Drummond notes, but there’s no evidence that respondents’ race or gender significantly affects their responses. Occupation, he observes, has more impact: People in high-pressure jobs, such as EMTs and doctors, tend to respond much more slowly to stimuli than the average person. The medical equipment and high-tech interfaces may seem novel, but neuromarketing is a very old practice. As early as the 1950s, researchers used skin-attached sensors to measure physiological responses to marketing. The biggest difference now is how much cheaper and easier it is to collect the data because of the attendant technologies. Mike Bartels is the director of marketing research and user experience at Tobii, a Swedish neuromarketing firm specializing in eye-tracking technology. Tobii has done research studies with Google and Facebook, using both traditional focus-group-style testing and in-home studies. Respondents are given a pair of specialty glasses that measure eye movements, then sent home and told to act normally. Facebook and Google were especially interested in studying “shared attention,” the way people move between screens—say, watching Netflix on TV while also scrolling through their Instagram feed on their phone. Bartels’s study looked at “queues,” specific triggers that make people go from looking at one screen to another. “You almost have to trick people into looking back up at the [TV] screen to see the commercial, in a way,” he told me over the phone. Music during commercials is generally a signal for people to keep looking at their phone, though if the song is unfamiliar, a person may look up to see what’s playing. Commercial breaks tend to trigger a shift from one device to the other, though eye-tracking data suggests this is less pronounced as the show goes on. You’re more likely to check your phone during the beginning of a show than the end. Bartels says data from Tobii’s studies can also tell user-experience designers precisely where and when users faced difficulties navigating the site, when they lost interest, or what caught their attention the most. This is particularly useful, he said, because most of us are navigating sites unconsciously and couldn’t, off the top of our heads, tell you why or when we moved from one screen to another. “So much of the way that we use mobile devices and websites is muscle memory, especially these things like Facebook and Twitter that we’re using over and over again,” he said. Bartels and Drummond agree that the future of neuromarketing will involve augmented reality, virtuality, and a shift to in-home observations that require less equipment. The highest-end iPhones already come with “face capture,” which can track and categorize muscle movements. MoviePass’s co-founder wants to build a smartphone app that tracks users’ faces to make sure they’re paying attention to their screen as ads play, rewarding them with movie tickets as they accrue screen time. Samsung’s Galaxy S5 and Note8 both have built-in heart-rate monitors, accessed by putting your finger on a button on the backside of the phone. Soon enough, neuromarketing proponents say, it won’t take eye-tracking glasses or EEG to trace bio-signals.